MENOMONEE FALLS, WI (December 6, 2012) - McDermott Cue Mfg. LLC is a leading manufacturer and worldwide distributor of pool cues, performance shafts and billiard accessories. McDermott is proud to announce that they have moved to a brand new location. The new location features an upgraded facility and showroom. In the past, McDermott’s showroom has primarily consisted of their own brand of pool cues and accessories. 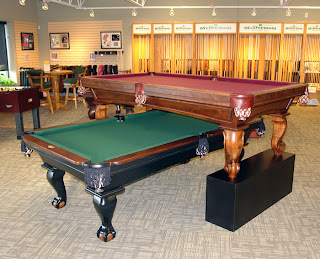 The new showroom will now add popular game room gear such as pool tables, foosball tables, air hockey tables, shuffleboard tables and billiards lights. The showroom isn’t the only thing upgraded at the new facility. The pool cue manufacturing process has been improved with new production equipment and a streamlined workflow. McDermott’s new factory showroom is open in time for the holidays and operates from 8am to 5pm, Monday through Friday at N84 W13660 Leon Rd, Menomonee Falls, WI 53051. For more information about this press release, contact Derek Blaguski, Marketing Director, at derekb@mcdermottcue.com or call 262-345-6506. More information can be found at www.mcdermottcue.com.